Dominating the compact SUV segment for as long as one can remember, the new-for-2012 Honda CR-V intends to retain its sales crown with a host of new refinements. In addition to Honda's legendary reputation for reliability, the 2012 CR-V boasts an all-new design, improved fuel economy and a more upscale interior. Reliability and comfort, easy to drive, great car! I really like the comfort of the ride, the reliability of the car - Honda engines are famous for that, the functionality I need - ie a large trunk to transport a lot of stuff but also passenger space. It is great for trips as I do a lot of driving. It is good in the snow and I live in Michigan so that is really important to me. Great features like navigation. The biggest issue I have now is road noise - but I plan on replacing the tires soon. The tires that came with the car only lasted 3 winters/ 26500 miles which was really frustrating. 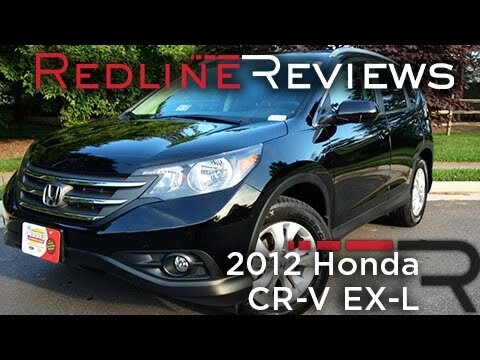 Love my Honda CR-V; will definitely purchase another Honda in the future! My Honda CR-V has been the be best vehicle ever owned. It's comfortable to drive and ride in. The gas mileage is great for a SUV, oil changes are 5,000 or more. The tires hatched over 63,000 miles, changed because I was going on vacation, still were decent. I've had no engine issues, great brakes, etc. I do take extra key good card if my vehicle and regular servicing which I am sure is a plus, however, my sister has the same car, no issues and she much harder on the engine's vehicle and has over 100,000 miles!! I love the mileage and it is easy to navigate as it is quilt and light. My Honda CR-V is an exceptionally good car for my busy mom driving lifestyle. It gets great mileage which is very important to me and it has all the convenience issues I wanted. The USB port, sunroof and rear backup camera all came standard on my Honda crv. The other feature I really like about the CR-V is that the trunk space is very generous for the size car it is. I also like the height of the car, it is easy for people of all ages to get in an out of easily which is very important to me. Honda will notify owners, and dealers will apply the corrective label free of charge. This recall is expected to begin on, or about, November 6, 2012. Owners may contact Honda at 1-800-999-1009.